Color: green, blue yellow orange, gray and so on. Packing: lined with PVC strips and wrapped with PVC or stainless cloth. Different colors available for customers choice. Application: Rebar bundling and packing; Fencing wire for Chain link fences, industrial mesh fences; Coat hangers and handles. Coil weight per roll: 50kg. 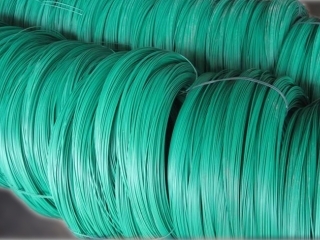 PVC Coated Tying Wire with Annealed Wire as Core Wire. Plastic coated wire 1.2mm diamater, materials black annealed wire 0.8mm.